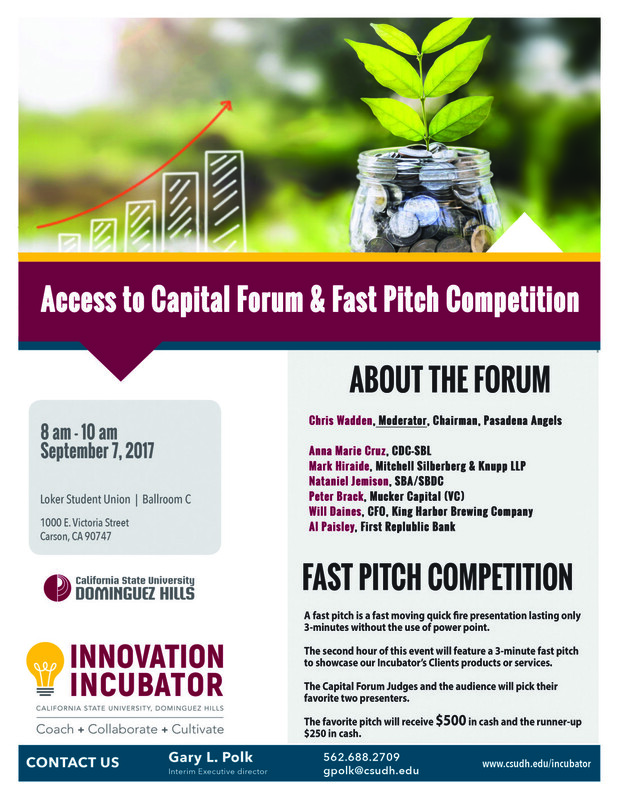 Mark Hiraide will be participating at the Access to Capital & Fast Pitch Competition hosted by the California State University Dominguez Hills Innovation Incubator on Thursday, September 7, 2017. A fast pitch is a fast-moving, quick-fire presentation lasting only three minutes without the use of PowerPoint. The second hour of this event will feature a three minute fast pitch to showcase the Incubator's clients products or services. The Capital Forum Judges and the audience will pick their favorite two presenters. The favorite pitch will receive $500 in cash and the runner-up $250 in cash. Mark will be joined by co-panelists Anna Marie Cruz (CDC-SBL), Nathaniel Jemison (SBA/SBDC), Peter Brack (Mucker Capital), Will Daines (King Harbor Brewing Company), and Al Paisely (First Republic Bank).